So I found the coolest thing in my email last week! 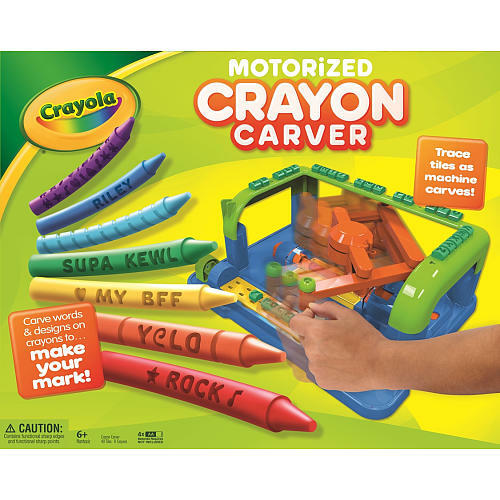 Crayola is always coming up with new products and I love it. Their latest one is the Crayon Carver! I remember when I was sending my kids to preschool and I had to write their names on all of their crayons. Sometimes we did that at home so that when we traveled, we'd be able to find and keep track of everyone's art supplies. Do you have this challenge? If so, you may love this new gadget! Even if you don't have to put your kids names on them, it's a great way to teach them colors. Plus, it's just fun to do! Right now, it is only available at ToysRUs.